There’s no shortage of good Software Defined Radio (SDR) apps for RTL2382-based dongles, but wouldn’t it be nice if they could be driven remotely? WebRadio is a project I have been working on which aims to be a fully functional SDR with a user interface that runs in a browser. The front-end is separated cleanly from the signal processing server by a (fairly) RESTful JSON API, so alternative GUIs are also an option (smartphone apps being the obvious one). A key feature of the design is server-side decoding of data modes. Since the original impetus for WebRadio was my involvement with a local school’s high altitude balloon project, initial focus will be on making it decode RTTY, but the modular design makes it easy to add other decoders. Currently the project builds and runs on a Linux PC, but with only basic functionality (tuning for a single receiver and selection of AM and FM). Channel filtering also needs some improvement, after which SSB will work as well – this is next on the list. The GUI is known to work properly in Chrome; for other browsers, for now, YMMV. Take a look. This entry was posted in Linux, RF, WebRadio on July 28, 2013 by Mike. Thanks for that nice project! Got it running on a 2 GHz Sempron with 8 GB of RAM which seems a bit slow. What is your minimum recommended setup? Hi. I haven’t benchmarked yet, nor is it very well optimised. I’m working on this at the moment so check back soon to see how things have improved. Ultimately I’d like to get it running at least a single receiver on a raspberry pi! Sounds great, I’ll stay tuned. Do happen to know howto start it with less bandwith? anyway keep developing looks promissing allready!! Hi. They’re hard coded in main.cxx for now. Remember the rtl sticks only accept certain rates – try 1.2 Meg. Can you give any clue on this problem ? Hi Ben. This looks a bit like the usual one where libmicrohttpd is too old, but it’s not quite the same. Someone recently commented that you can get the .deb for libmicrohttpd from the latest Ubuntu and install that manually without any adverse effects. Maybe give that a try? Mike, indeed after manually installing libmicrohttpd (from source, could not get the deb to install without errors) “make” does succeed without errors, starting webradio gave on error which pointed to libmicrohttpd10 after which webradio does start, finds the dongle(s), chooses the right one and starts sending messages in the terminal screen about waterfall and so on. Chrome however (both locally on this Ubuntu server and remote from my livingroom PC) does show the webradio, plays audio (FM, FMW, AM) noise but shows no waterfall or frequency on the screen. Any hint on that ? Jquery installed? I didn’t want to bundle it until I’d checked out licensing. There’s a readme in the html subdirectory which explains installation. Got it running now. Indeed I did have to install Jquery which I did install on the laptop I started the installation on, but after moving to my Ubuntu dual monitor system I did completely forget to install it there also. Nice work !! Now I’m gonna play with it…. Did you read the readme about jquery? Lost bytes implies your CPU isn’t fast enough. Are you trying to run on raspberry pi? why it work websdr with pi ? the rtl2832u ist the problem ?? You mean you are actually running the websdr server on a Pi successfully? Ah right. 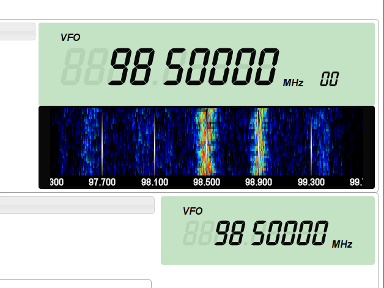 He’s using a Softrock SDR – the sample rate is 48 kHz compared with 2.4 MHz for the default build of WebRadio. WebRadio has to process 50 times more data running from the RTLSDR (although you could try reducing the sample rate – it does support some lower rates). Then run autoreconf and configure/make again. Not tested – if it doesn’t work let me know and I’ll try it in a virtual machine. I got this error message … what can i do ? I installed the program. There was no problem, starts normally. When I open the page in a browser, the following error message I get. Mi Linux is a Debian Wheezy. Your computer’s too slow. Raspberry Pi? Did you install jQuery as per the details in html/README-jquery? i install it on dual core pc.it is working 6% usage.everything is workin. the only problem is that i have sound in chrome explorer for 5 seconds and after i loose the sound. also mr Mike please inform me where i can change the center frequency and sample rate? Don’t try to use the toolchain on RPi or even BPi. I don’t works. Even if you set a samprate of 250kS you only get dropouts (Lost bytes). So no chance on Arm RPi/BPi CPUs. First thanks to Mike for Webradio development! I run Webradio on my Raspberry Pi2 with Raspbian Jessy. It works well with my SDR-RTL Stick. I know it is very time time-consuming to develop such apps. My question is : any plans / motivation to continue this nice project. Hamlib Integration would be a plus. Hopefully this project will continue.